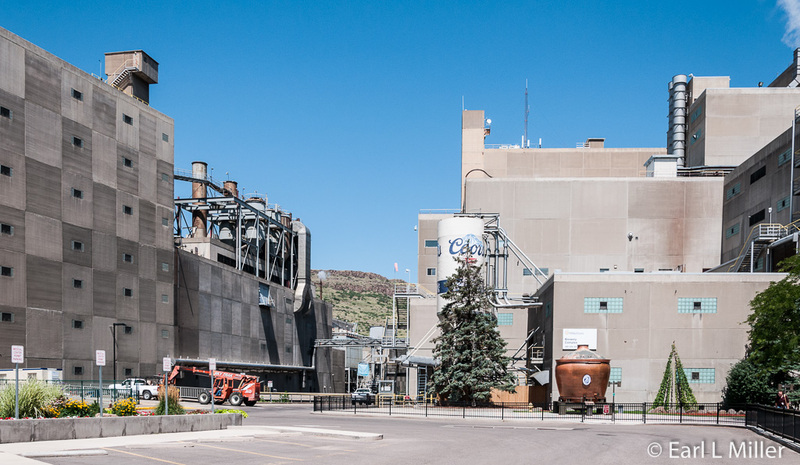 The MillerCoors Brewery Tour is the best known attraction in Golden, Colorado. It provides visitors with insight into the company history and an understanding of how they brew and process their beer. You can also peek into their quality control lab and purchase Coors items at their gift shop. You don’t park at the MillerCoors factory but in the southwest corner of their parking lot located at 13th and Ford Streets. There you wait for the 16-passenger vans that transport visitors on a three to five minute ride to the plant. Be prepared for a long wait. We stood for 45 minutes before we boarded. MillerCoors provides a shelter to stand under but offers no place to sit down. 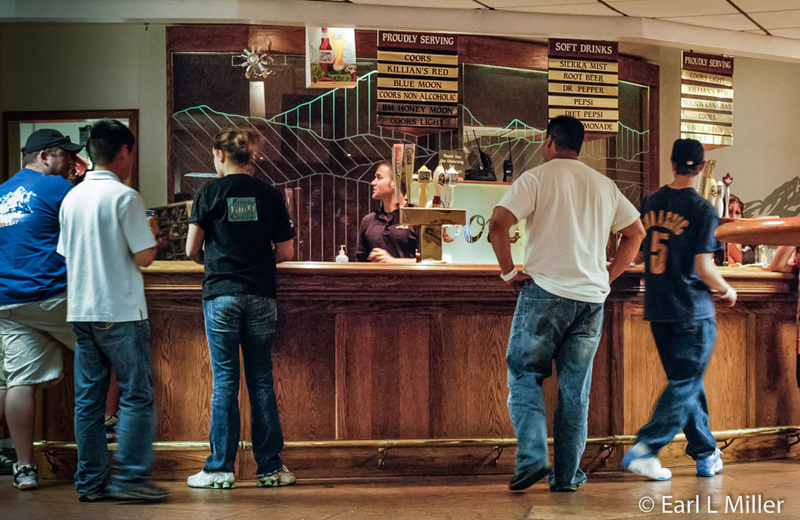 It is vital to remember that NO backpacks or bags of any kind (purses, briefcases, computer bags, or backpacks) are permitted to be brought into in the brewery or carried on the tour. Adults must also present a valid photo ID. When you arrive at MillerCoors, they check your photo ID and give you a wristband and audio phone. They ask for these wristbands before handing you any beer to sample. You’ll stand in line again so they can take a $20 souvenir photo available for purchase at the tour’s end. At that price, we easily turned this sale down. To sample any of their beer, you must be at least 21 years of age to imbibe. You’ll be handed a shot glass of your choice of Coors or Coors Light midway through the tour. When you arrive at the Coors Brewery hospitality room at the tour’s end, you can sample two to three ten ounce glasses from a menu of several choices. If you prefer, you can order soft drinks. Be prepared for a really long line here. Restrooms are provided in the middle and the end of your tour. Tours are self guided. As you follow the hallways, you’ll discover large numbered demonstration stations. At each station, you press the number indicated on your audio phone and hold the device to your ear. You can then listen to lengthy descriptions of what you are seeing. You’ll find employees posted at various stations with whom you can ask questions. 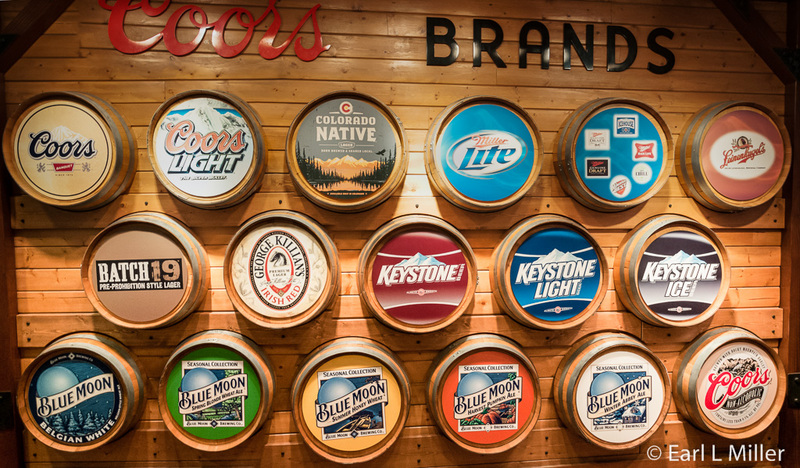 Not only will you see the manufacturing process in action, you will also see photographs, signs listing facts and figures, and Coors and Miller artifacts and memorabilia. Feel free to take as many photographs as you choose. You can take tours from June through Labor Day. 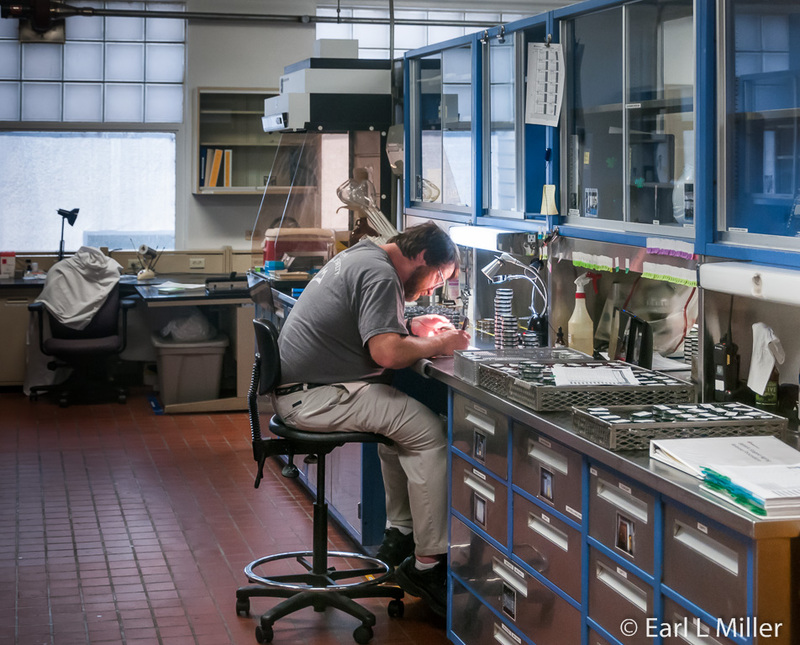 Hours are Monday through Saturday from 10 a.m. to 4 p.m. and Sunday from noon to 4 p.m. During the rest of the year, the plant is closed to tours on Tuesdays and Wednesdays, but on the days they are open, the hours remain the same. They do close for major holidays. To confirm days and hours prior to your visit, call (800) 642-6116 or (303) 277-2337. MillerCoors was originally the dream of two German immigrants who came to the United States in the mid-19th century: Frederick Miller and Adolph Coors. Frederick Miller, born in 1824, settled in Milwaukee. He learned the brewery business in Germany from his uncle, a brewer in Nancy, France. After going through the ranks, Miller leased the royal Hohenzollern brewery at Sigmaringen, Germany. He brewed beer under a royal license until political unrest caused him to immigrate to the United States in 1854. Upon arriving in Milwaukee, Miller purchased the Plank-Road Brewery, located several miles west of the city, and founded Miller Brewing Company in 1855. He brewed his beer from yeast that he brought from Europe. Descendants of this yeast are still used today. He died in 1888. The Miller family continued his legacy until 1966 when W. R. Grace Company purchased most of their stock. In 1969, Philip Morris Inc. bought the firm then obtained the rest of the family's stock in 1970. In 2002, South African Breweries purchased Miller Brewing Company to create SABMiller plc. It was the second largest brewer in the world with a distribution of hundreds of brands. Adolph Coors was born in Rhenish, Prussia in 1847 and apprenticed at Wenker Brewery in Dortmund, Westphalia for three years during his teens. He followed this by working as a paid employee at Wenker and other German breweries. In 1868, he stowed away on a ship to America arriving first in Chicago, then moving to Naperville, Illinois. There he became foreman at John Stenger's brewery. After resigning from that brewery in January 1872, Coors arrived in Denver in April. Coors and Denver confectioner Jacob Schueler purchased the abandoned Golden City Tannery in 1873 and converted it to the Golden Brewery. In 1880, Coors purchased Schueler's interest, and renamed the brewery Adolph Coors Golden Brewery. He incorporated his company in 1913. While Prohibition resulted in many breweries closing, in 1916, Coors changed his brewery to make a de-alcoholized "near beer" called Mannah, and malted milk. The firm also manufactured porcelain and ceramic products made from clay mined in Golden. The Coors Porcelain division spun off in 1992 and later changed its name to CoorsTek in 2000. Coors died in 1929 when he jumped from a sixth-floor Cavalier Hotel window in Virginia Beach, Virginia. The company was then led by his descendants. In 2005, Coors merged with Molson to create Molson Coors Brewing Company. The following year, SABMiller and Molson Coors joined to form MillerCoors. In 2009, the company opened their Chicago headquarters. In 1886, Miller became one of the first breweries in the world to pasteurize its beer. In 1890, Coors introduced an artificial ice manufacturing plant. It was the beginning of mechanical refrigeration at their factory. Miller Brewing Company followed in 1897 with mechanical refrigeration. This meant the company could now ferment and mature beer above ground. Previously, it had been chilled by using ice blocks in limestone caves near their Milwaukee brew house. Coors received patents for a corking machine and bottle washer in 1884 and the next year launched their first recycling project, 45 cents for a dozen empty quart bottles. Miller first used the brand name Miller High Life in 1903 when the beer was packaged in clear bottles. 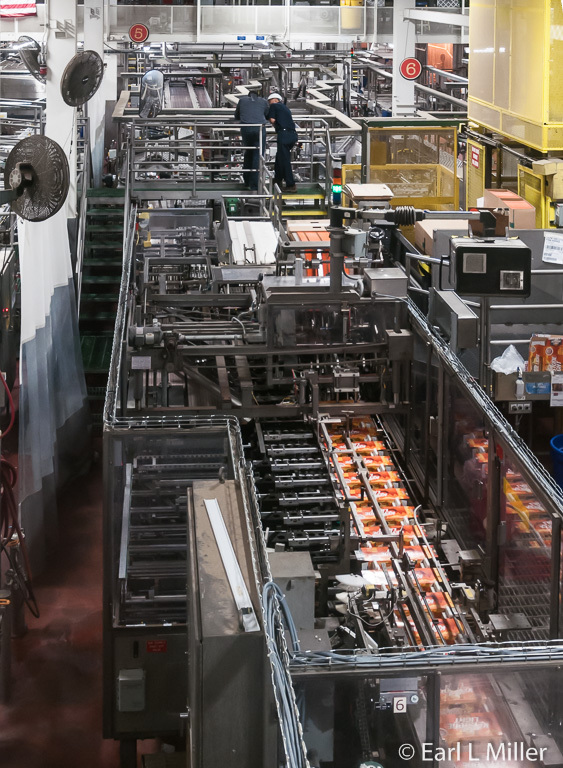 The name became well known over the years.. During the following year, mechanical filling, labeling, and capping went into full production at Miller. In the early times, local coopers had originally packaged beer in kegs they had made. Both companies started producing beer in cans in 1936. In 1937, Coors adopted the slogan “Brewed with Pure Rocky Mountain Water.” This slogan served the company for 50 years. In 1952, Miller bottles and cans were first sold in six packs. Coors introduced the country’s first all-aluminum two-piece beverage can in 1959. During the same year, they had a recycling campaign offering a penny for every can returned to the brewery. In 1975, Miller launched Miller Lite, the first nationally distributed low-calorie beer. Coors followed this in 1978 with its Coors Light brand called the Silver Bullet. In 1986, Miller Genuine Draft appeared. It was the original cold-filtered, packaged draft beer. Since that year, both companies have continued with innovations ranging from new beers to designing different types of cans and bottles. For example, Coors introduced in 2005 Coors Light as the first beer available in an 8-ounce serving. In 2007, they produced the Cold Activated bottle and in 2008 the Cold Activated can. Both feature thermochromatic ink which turns the mountains on their bottles or cans blue when Coors Light is chilled to a certain temperature. Coors also introduced packaging in 2011 called the Cold Activated Window Pack. It allows you to see if the beer is cold right through the carton. Their Two-Stage Cold Activation allows not only the mountains to turn blue but has a second indicator that turns blue when the beer is super cold. In 2009, the Miller Lite Aluminum Pint, a 16-ounce pint bottle hit the market. It had a wide mouth and resealable cap. In 2010, Miller Lite introduced 12-ounce Vortex Bottles, which have a specially designed, longer, grooved neck, allowing for an easier flow from bottles into glasses. During the same year, for those who like draft beer, Miller Lite and Coors Lite came up with a 5.7 liter Home Draft system. The system, which is CO2 pressurized, provides 16 12-ounce pours of draft beer. Before you take the elevator to the second floor, where the tour begins, you’ll see a board listing the company’s many products. The first exhibit upstairs that you’ll see is about the ingredients MillerCoors uses. These consist of water, hops, barley, and yeast. Coors believed that great beer begins with great water and he chose his Golden plant location because he could use Rocky Mountain water. It was pure but had the right mineral content. Hops come from Idaho, Oregon, and Washington. For some specialized beers, the company imports hops from Germany and New Zealand. It’s hops that adds aroma and different flavors to the beers and acts as a preservative. Adolph Coors believed “Barley is to beer as grapes are to wine.” The company uses two row barley where the kernels are plumper. The company contracts about 75% of its barley from farms in Colorado, Wyoming, Idaho, and Montana. These growers use MillerCoors barley seeds under the company’s Grower Direct Program. Corn, wheat, and oats are also sometimes used. These are brought from Colorado and Wyoming. Corn supplies a milder, lighter-bodied flavor to beer. Yeast, the final ingredient, changes the cereal grains into beer through the fermentation of simple sugars and starches from grain into alcohol. 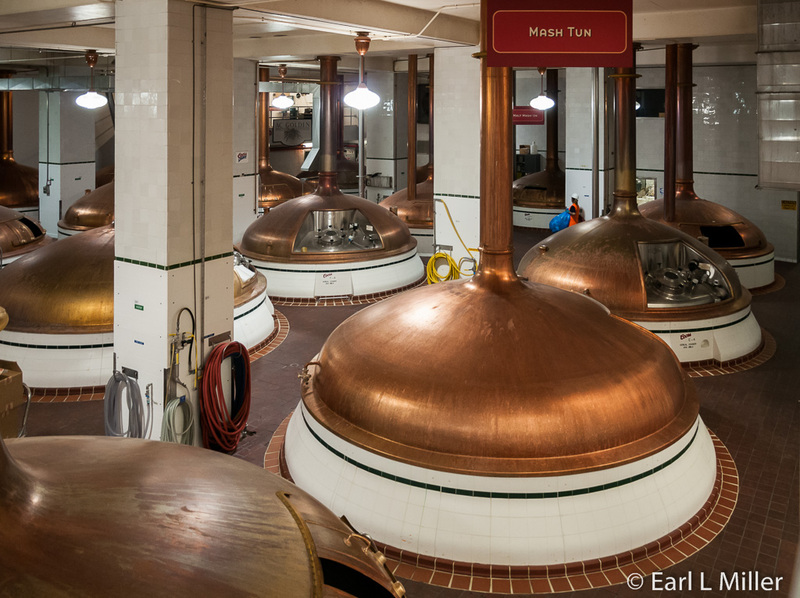 Since the yeast imparts flavors, this is how Coors gets different beer styles. Ripe barley is full of natural starches. These have to be converted into simple sugars and starches before the yeast can work. In malting, the company takes partially sprouted grain and toasts it to produce malt sugar and a golden hue. This is done in several steps. The first is called steeping. The barley is soaked in water to clean it and moisten it for germination. During germination, the barley starts to sprout and raw starches break down naturally to form suitable starches and natural enzymes. Before sprouting proceeds too far, the barley gets toasted in a kiln which not only stops growth but controls the control and flavor. For example, it has a color from pale gold to dark chocolate and a taste that is mellow to bitter. Sprouting takes place in about five days. The next step is milling, but only after the malt has aged properly. The malt is ground into a flour called “grist.” In milling, the grain’s outer hulls crack so water gets in and dissolves the grain’s starch and sugars. Mashing comes next which converts any remaining starches into fermentable sugar. This is where the malt extract is sent to copper brew kettles called mash tuns. Copper is used because it leaves no metallic taste. Each kettle holds 19,000 gallons. 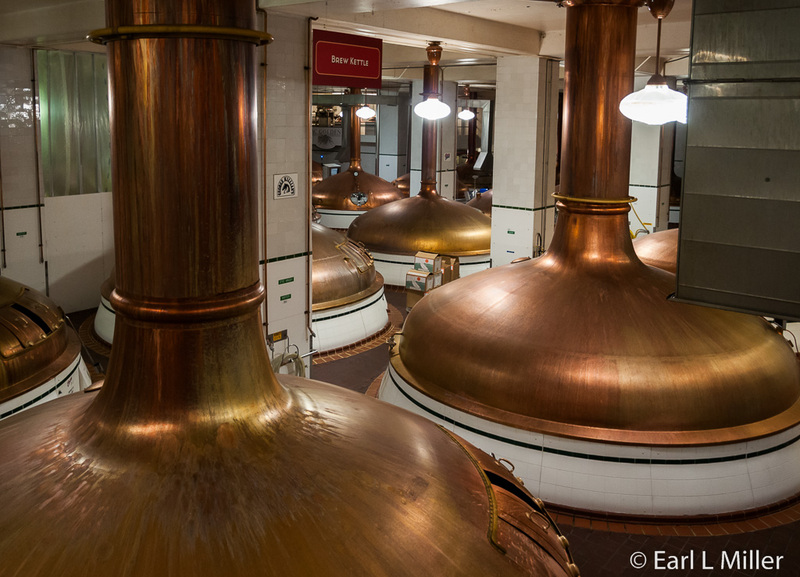 As many as 200,000 bottles could fit into each of the brew kettles. When the sugar level is correct, MillerCoors filters the mash to separate the grain’s solid husks and germ from the liquids. The solids become animal feed. The liquid, called “wort”, transfers to another kettle. Through boiling the wort, the liquid becomes clarified and excess water is reduced. Then hops are added. After boiling, the wort is strained, cooled, and transferred to a fermentation tank. Fermentation begins after the wort cools and yeast is added. The yeast eventually consumes the sugars producing alcohol and CO2. This process usually takes eight to ten days. The fermentation tank is kept at cool temperatures since heat is an enemy to beer. After fermentation, the filtered wort is now beer. 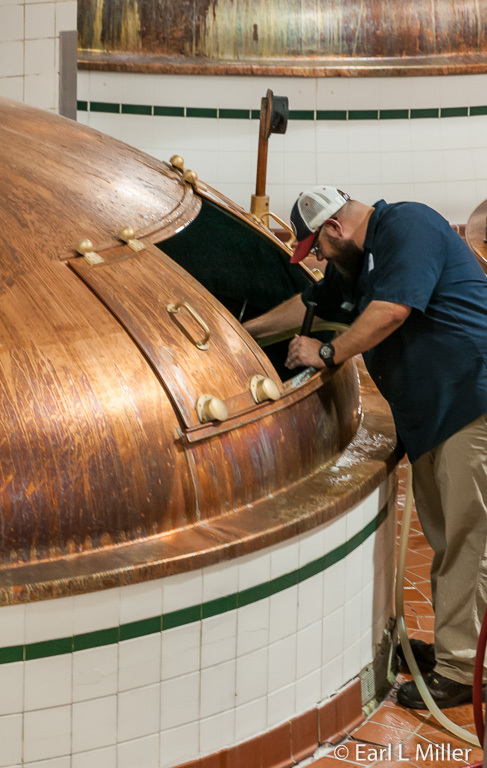 For most of the beers and all lagers, the next step, lagering, consists of aging and secondary fermentation in large tanks. This is when the beers develop carbonation and their own unique flavor. Ales like warmer temperatures than lagers so lagers are kept in cooler tanks. MillerCoors beers are then heat-pasteurized or cold-filtered and sterile-filled. With heat-pasteurization, the beer is slowly warmed to 140 degrees then cooled to room temperature. Cold-filtering requires cold storage and several filtration steps. The entire brewing process takes an average of 55 days. The company uses a variety of packages and container sizes. Not all brands are found in all package sizes nor are all brands available in all areas of the United States. Since light is another beer enemy, the company uses mostly dark brown or green bottles to help protect their product. Patented light-stable hops are added to those sold in clear glass bottles to eliminate light sensitivity. 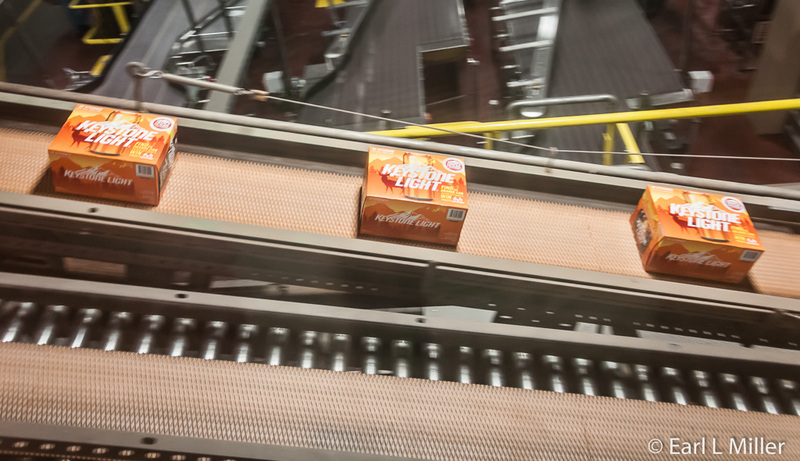 As an environmentally conscious company, Coors sets goals to reduce packaging and waste. A third enemy to beer is age. All cans, bottles, carriers and kegs have coded easy-to-read “sell by” dates. These codes also indicate the beer’s packaging date and the brewery, location, production line and time it was brewed. Shelf life is 119 days. Quality of their products is important to MillerCoors.. In their quality control labs, they test every step of the process from raw ingredients to the final product. You’ll pass one of these labs on your self guided tour. Chemical analysis and tastings help monitor water purity, the grain starch content, hop bitterness, yeast quality, and alcohol conversions. They also employ 200 taste testers who check daily check for flavor, aroma, color, and consistency. To distribute MillerCoors products to bars and grocery stores, the company started using delivery trucks in 1910. They also use railroads. MillerCoors distribution is 60% cans, 30% bottles, and 10% kegs. The company claims a zero taste difference between the three types. Golden is the largest, by volume, of the eight MillerCoors breweries across the country. It is also one of the biggest single-site breweries in the world. MillerCoors has a joint venture with Ball Corporation in operating the nation’s largest aluminum can manufacturing plant. It also has a joint venture partnership with Owens-Illinois running a glass bottle manufacturing plant. 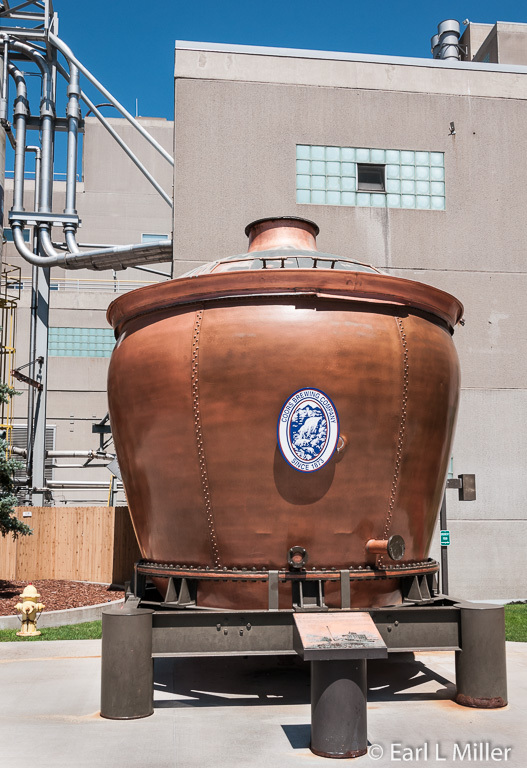 A giant copper kettle, a couple of stories tall, stands in front of the MillerCoors brewery at Golden. This kettle was hand-hammered and helped brew Coors Beer from the 1890s until 1914, the year Prohibition started in Colorado. The kettle has stood outside since the 1990's.